2. 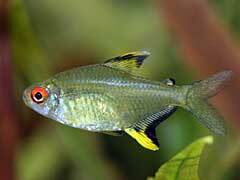 Oscars – If you want tropical fishes with lots of personality and healthy life spans, these are a great choice. They can be up to 12 inches in length and can live for almost a decade. 3. Fantail Guppy – Because they require no special care, guppies are a great choice for first aquariums or for children. 4. Rainbow Fish – As the name suggests, these fish have intense and beautiful colors (especially among the males). You should keep them in groups of up to 5. They don’t have any special care requirements so they fit in with almost any freshwater aquarium fish. 5. Corydoras Catfish – If you need a bottom feeder, these catfish which love to live in small schools make a great choice. 6. Plecostomus – To keep the algae from growing in the tank, the Plecostomus is a great choice. When their mouths attach to the sides of the tank, they are mesmerizing to watch. 7. Clown Loach – One of the most beautifully colored varieties of freshwater tropical fish, the clown loach has a red tail with a gold and black striped body. They are lovely to watch in any tank. 8. Kissing Gourami – If you don’t mind investing in a large acrylic aquarium, these fish are a great choice. The name comes from the appearance of the male fish when they are locked at the mouth to other males in territorial disputes. 9. Hatchet Fish – If you are looking for freshwater aquarium fish that are shy and don’t like sudden movements, these make a good choice. They don’t do as well in homes with small children and live happiest in groups of up to 10. 10. Neon Tetra – These are the most common aquarium fish and do well in most environments, as long as they have tropical fish food flakes. Any of the above choices would be perfect freshwater aquarium fish for most tanks.